Surrounded by giants and famous places, Walcott is most often bypassed except by caravanners in the summer months. All Saints sits inland, away from the village with just a couple of cottages for company, rather bleakly in the fields in early spring. Daffodils for the London market fill the acres around; but I can never really get on with daffodils, especially here in their spartan rows. The modern fashion for filling wild places with cultivated daffodils seems to me very misguided, leaving everywhere looking vaguely municipal in April, and then scraggy and unkempt in May. But the wall-surrounded graveyard still feels a wild space. As with most of the churches round here, All Saints was rebuilt in the early 15th century. Unlike nearby Hempstead and Swafield, which it otherwise much resembles, the tower was rebuilt here as well, giving us a building which is at once crisp and ancient. I love the way the tower stair turret is set at a diagonal to the tower. 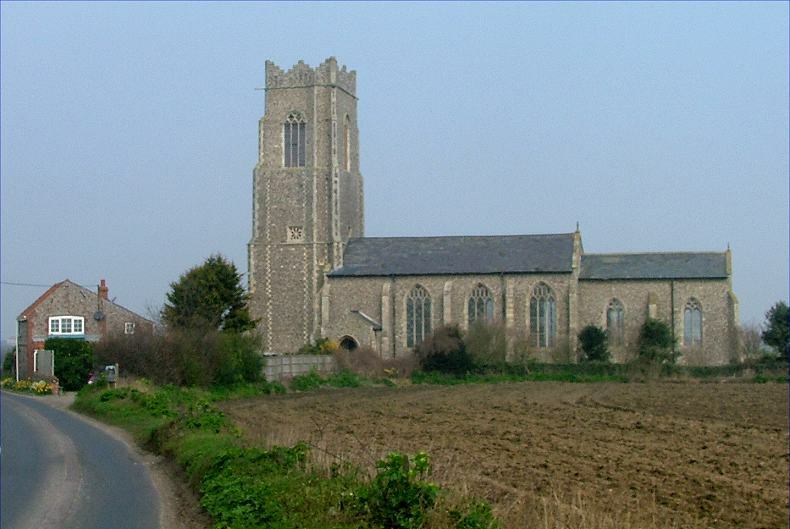 A hundred years later, we would be building churches like Shelton, quite different in feel and character; and then the Reformation would put an end to virtually all church building in East Anglia, until the Victorians came along. All Saints inside is full of light, a typical pleasantly Victorianised space with some decent medieval survivals, including a handsome, tall screen. The font, as with most local churches, is a 13th century Purbeck marble affair, obviously from the earlier church. The piscina and sedilia in the chancel are also fine. The Victorian lump is leavened by some excellent early 20th century work, mainly from the 1920s, including a super art nouveau brass lectern, sensibly bolted to the floor, and an even more unusual art deco organ. The war memorial is also grand, and substantially in the same style, although a hint of romanticism makes it rather mawkish. Soon, modernism would do away with all of this, of course, and in either accepting or rejecting modernism we would determine the look, feel and shape of our churches for the rest of the century.